3 sets of GNMS-1000D mud desanding plant have been dispatched to the client’s jobsite weeks ago. It is ordered by a GN regular client. They already own some different sizes desanding plant from GN Solids Control. They are happy with the performance of the separation plants. When they have new projects, they are willing to come to GN for solution. 1) It is a very compact design sand removing plant for HDD, CBM, Piling, micron tunneling, water well drilling, and other underground construction activities. 2) The GNMS-1000D mud desanding plant is composed of a full set solids control double deck shale shaker. The shale shaker is with 2 ea 10 inch hydro cyclone desander cone on its top. It saves the system footprint, and integrated with the function of both solids control shale shaker and mud cleaner. 3) High quality parts, like 100% PU hydro cyclone, International famous brand vibration motors, composite material shaker screens, ensure longer lifetime and reduce the maintenance cost. 4) The GNMS-1000D mud desanding plant is an economic design system. It is cost economic. Clients can do the job with a smaller fund investment, and with a higher return rate. 5) The inland shipping dimension is L3780 x W2162 x H2612 mm, Total weight is 3700kg. It is convenient for movement. 6) The operation dimension is L4176 x W2162 x H3796mm. It is a very small footprint occupation. 7) Total power of the system is 59Kw. The plant is a separation system; users can choose a separate mixing unit for preparing new mud. But the mixing and storage tank, GN recommend clients to prepare locally to save the total cost. Besides the economic design desanding plant. 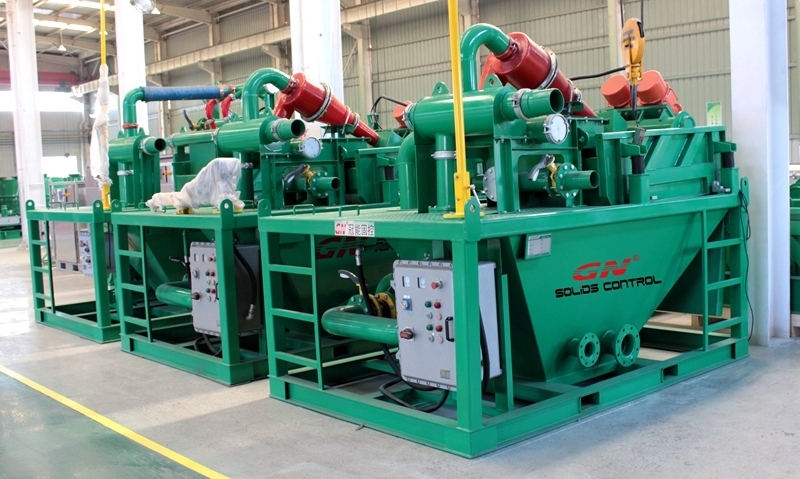 GN Solids is China leading supplier for full functional mud cleaning system with compact design. If you have interest for more information, welcome you contact GN at GN Solids Control / GN Solids America / GN Solids Russia for more details.